Now that Swift is open source, many interested users might be installing and testing it on their Linux systems. However, currently the Foundation framework is still very much a work-in-progress so if you're interested in developing more than a simple shell app, you'll need to link against existing Linux libraries like GTK, Cairo, or libpng in order to gain access to useful functionality. I just finished implementing a simple Swift app which links against X11, the most basic Unix UI library 1. In this short tutorial, I'll show how to write a simple X11 app, and how you can utilize this to link against other libraries. In the process, we'll also use the new Swift package manager to create a simple re-usable package for the X11 library. Before we write our actual X11 app, we need to define a Swift package which defines the links against the X11 library. Once this is done, we can easily share this package with other users, or re-use it in other projects. We have to differentiate between defining a package and using a package. Let's start with the first and then see how we can use that package. We're naming our module CX11 and we're creating two submodules. One for the Xlib and one for X. Each submodule defines the header it needs to import. Finally, we're linking against libx11 via the link statement. But what if we have not just one header file, but many of them. Module maps allow you to define an umbrella header or an umbrella directory. The commands above go into the folder, create a new Git repository, add all the files to it, create a first commit, and finally add a version tag (1.0.0) for this commit. That's it, our package is defined, but how do we use it? In order to use a package, we need to define a Package.swift file which will tell Swift which packages we intend to import for our project. But first, we need to create a directory for our project. This tells Swift that the package we intend to use is located in the ../CX11.swift folder. Now that we defined an X11 package, and set up the package manager definitions, we want to write our first X11 application. After this, we have to define a couple of variables. We need a placeholder for the X11 window which we create. This will be the w variable. We also need to set aside a bit of memory for the X11 Server to store X11 input events. This is the e variable. We need a place to store the current X11 screen (a X11 Display can have multiple screens). This will be the s variable. Finally, we need a pointer to the X11 root window, which houses the other windows. This is the rootWindow variable. var msg = "Hello Swift World"
After we opened the display, we'd like to get the current default screen as well as the current root window. The RootWindow macro is not available4, so we will access the memory section of the C struct directly. However, as the current screen s is a UnsafeMutablePointer, we need to add the memory property in order to access the root instance. border and background are color values. In order to not think about color creation, we will simply pass in a reference to the default black and white colors which are defined on the current screen. We have to use the .memory property again. This will create a new window on the rootWindow position 10/10 of width 200 and height 100. The borders will be black, the background will be white. Our e event structure is - again - a UnsafeMutablePointer, so we have to access the actual structure via the memory property. The Expose event means that the window is visible, so we have to re-draw it. Our drawing is very simple: We're using the XFillRectangle call to draw a small black box, and the XDrawString call to draw our initial msg text in the window at position 10, 70. Please note that I don't know whether X11 expects unicode or ascii, so the Int32(msg.characters.count) is probably wrong, but it works in this example. The other event, KeyPress allows us to break the outer while loop and quit the app once the user enters a key. This will clone the CX11.swift package and build the binary in the .build/debug folder. 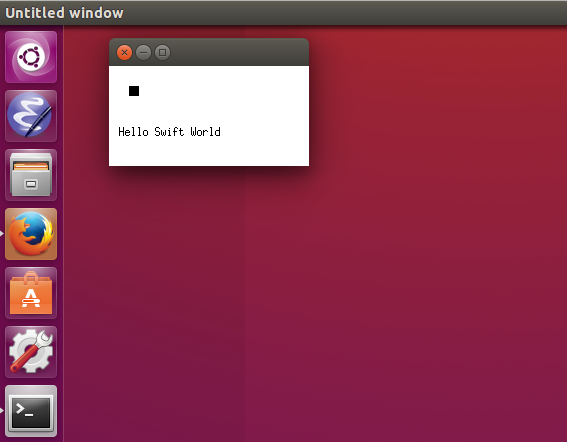 This was a very simple example of how to use Swift under Linux to write an X11 app. This will also work for all kind of other apps using other libraries, of course. This tutorial also explained how the new Swift Package manager works by creating and using a simple X11 package. The full example of the X11 app can be found here. The full example of the X11 package can be found here. "The convention we hope the community will adopt is to prefix such modules with C and to camelcase the modules as per Swift module name conventions. Then the community is free to name another module simply JPEG which contains more "Swifty" function wrappers around the raw C interface."